Members of a joint Japanese-Rosilican expedition to Infant Island, scene of H-Bomb testing by the Rosilican government, find the heavily-radiated island still holds life: some beautiful young women, Ailenas, only two feet high and guardians of Mothra, a sacred egg. Nelson, one of the men on the expedition, returns to Infant Island to kidnap the young Ailenas, planning to exhibit them around the world. The egg hatches, a gigantic insect larva which crawls into the sea. When the lana, now grown in size, reaches Tokyo, it wreaks considerable havoc before it begins to spin a cocoon. Rosilican and Japanese troops attack it but their atomic heat rays only speed the metamorphosis of the larva into an adult moth of colossal proportions, impervious to all their weapons. Nelson flees to Rosilica with the Ailenas; Mothra follows. It destroys the capital city and Nelson is killed by angry Rosilkan demonstrators. 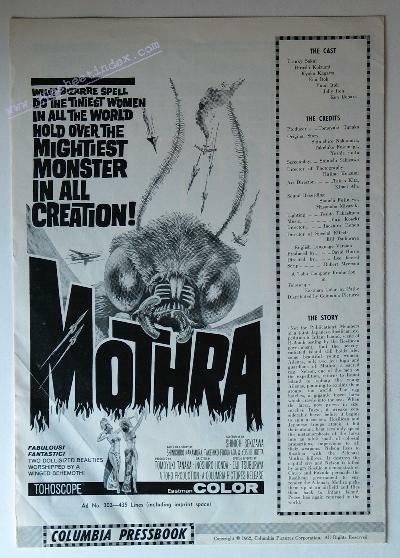 Chujo and Fukudo persuade the Rosilican government to surrender the Ailenas; Mothra picks them up at an airfield and flies them back to Infant Island. Peace has again returned to the world.